Have you noticed the word 'compassion', or derivatives of it, cropping up increasingly of late? It's a word that the left loves. But it needs a new definition. Spending other people's money to make oneself feel righteous, perhaps; The state supposedly fixing problems but actually making them worse, perhaps. The Greens have launched an entire project entitled "A compassionate economy". By definition if you aren't a Green you aren't compassionate. You are hardhearted, cruel, uncaring. But do you notice that the Green's form of compassion entails even greater use of force against individuals? Is it compassionate to force people to take responsibility for problems not of their own making? Is it compassionate to prevent people from freely pursuing life, liberty and happiness because others don't understand or care about those things? Someone called Deborah Russell (a taxation lecturer from Massey) recently wrote a column in the Dominion Post calling for the welfare state to be compassionate. She said she was happy to pay her tax for it to be so. She said specifically that the welfare system should err on the side of compassion. Rules for eligibility should not be toughened up as recommended by the Welfare Working Group. NZ has been erring on the side of compassion since the 1972 Royal Commission on Social Policy urged as much. Then around 8,000 sole parents were receiving an emergency benefit and it was considered caring and inclusive to create a statutory benefit that guaranteed welfare to any single parent regardless of the reason for their single parenthood. Now there are 113,000 people receiving that benefit, along with nearly twice as many children who are often characterised as living in poverty and without the input of fathers. If that is the result of 'compassion' then perhaps it is time for a little less. The welfare system is in dire need of reform; not the continued application of thoughtless emoting. Paula Bennett is being too vague with the latest welfare reform policy. That became more painful to witness yesterday as Labour tried to tease out the details. OK. The policy is actually part of National's election manifesto; not an announcement of legislative change that will occur before November. But the way it is rolling out it really smacks of finger in the wind. Starting tough but softening under pressure. Perhaps the cash allowance will be more generous? Perhaps the range of payment card licencees will be quite broad? Notwithstanding that I want to see benefits made temporary for most, short of that, income management is not necessarily a bad thing. Certainly not "sinister", how Bradford's outfit described it. In Australia the policy began in some Aboriginal communities where children were being neglected and women were frequently the subject of 'economic violence' - their benefit cash was stolen from them. The policy was intended to protect women and children by ensuring they got the necessaries taken care of through a BasicsCard. Usually 50 percent (but up to 70 percent) of the benefit was loaded onto a card and could only be used for essentials. Then the government widened the policy to include young people who had been on welfare more than 13 of the past 26 weeks; families referred by child protection services; others that Centrelink defined as 'vulnerable'; and those who voluntarily chose it. The reasons for applying the policy to certain groups or individuals are clear. It would be easy enough to implement the same here. And to provide a clear rationale. It is impossible to stop people spending cash on what they want to but it is possible (with loopholes) to ensure that the basics are more likely to be attended to. Especially important when children are involved. But the way the policy has been mooted - applying only to 16 and 17 year-olds plus 18 year-old single parents - it is itself very vulnerable to criticism. And ensuing complication. Especially now a letter expressing Bennett's own distaste for income management has emerged. 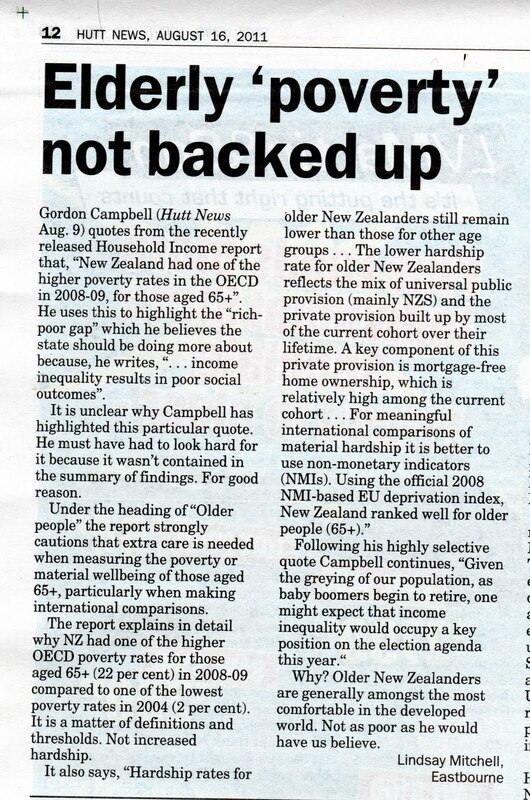 The Minister needs to be far more definitive about what National wants to do and why. 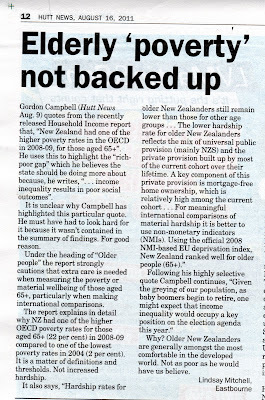 Gordon Campbell: Deliberately misleading the public? We are about 20 metres above sea level. Just up from the beach. Beautiful. And will be until the power goes out. Like it did last night. Twice. For long periods. I bought two extra hot water bottles today because I can heat water from the gas stove top. But that's it. Another night of chess by torchlight I am not looking forward to. But our trials, while very unusual, are minimal compared to others. Drove through steadily falling snow into Wellington yesterday to pre-record a Close Up interview. It was about National's welfare reforms for youth. Sitting next to me was Gareth Morgan who was against the reform. I was for but only as a first step. Gareth was also launching his new book about the benefit system yesterday and was taking the opportunity to push his Negative Income Tax or Guaranteed Minimum Income scheme - not sure what label he is using. 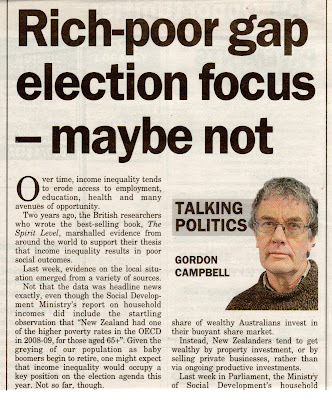 It involves scrapping all benefits in favour of everyone getting a yearly income from the state. I am against these schemes. They naturally grate with me because require even greater forced wealth redistribution. 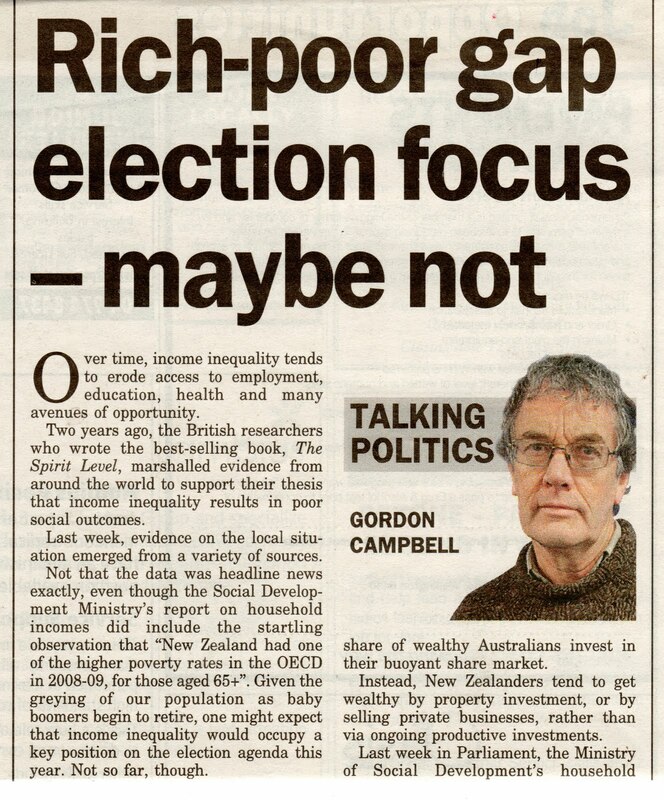 They require very high taxation (Gareth wants to use tax on capital gain). They disincentivise however in more ways than one. Labour productivity, savings, investment. And some of the worst off, lifetime invalids with high health costs reliant on the state, are ...even worse off. Strangely some of the Libz want these schemes and so does well-known American writer and libertarian, Charles Murray. Sue Bradford is also all for a GMI. Her and Gareth shared a platform at the initial WWG conference and agreed this idea as a way to solve many of the welfare problems. 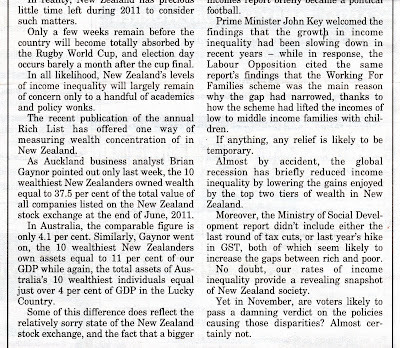 Consequently the WWG asked Treasury to model a GMI which gave every New Zealander 16 and over $300 a week. Here's their response. In the event the weather news overtook other items and the producer rang to tell me they had run out of time to use it but want me back on another day. Claudette Hauiti. More interesting than the welfare speech. Here's an interesting new candidate for National, Claudette Hauiti. I like her. And I don't think she is just mouthing platitudes when she talks about smaller government, less bureaucracy, more self-responsibility, and greater reward for hard work. But you would have to watch the video to get a sense of that for yourself. The welfare reform proposals that relate to young people on benefits announced today don't go far enough, welfare commentator Lindsay Mitchell said today. "Allowing the Ministry of Education and the Ministry of Social Development to share information about school leavers going on welfare should never have been stopped in the first place. " "Attaching obligations and money management regimes to benefits received by 16 and 17 year-olds, and 18 year-old sole parents, is an improvement on the status quo. However, many single parents enter the benefit system older than 18 still without the maturity or wherewithal to raise a child. Which begs the question, why draw an arbitrary line at 18?" "The new message being sent is, if you go on the DPB at 19 you won't get hassled. " "Today's announcement is a good start but doesn't go nearly far enough. Not only is it vital that existing teen parents are required and supported to continue their own education or training, but that more potential sole parents are discouraged from choosing or defaulting to the benefit lifestyle." "Strict time limits across all ages would act as such a deterrent." "If the government is serious about reducing New Zealand's very high teenage birthrate and the associated deprivation, it should promise an end to 16-17 year-old eligibility, and time limits - with some exemptions - extended to all others." Deborah Coddington is angry about fathers who renege on their child support payments. There are multitudes of reasons why exes refuse to pay, or can't pay, child support. Maybe they're broke. Some scum have income hidden in trusts. Often they just want to punish the other, following a bitter custody battle, so they think nothing of using their children as weapons. I call that child abuse, on the same bell curve as the man who threw his kids off a Melbourne bridge. There are many reasons, but no excuses. You split up, you take financial responsibility for your family. You don't blame everyone else and make the country pay. Not all liable parents are "exes". They were sperm donors. There was no "split-up". They don't pay child support because they are in prison, the mother hasn't named them as the father, they have more children and child support liabilities than a benefit can support. Think of the many who don't pay court fines. Some have been used to supply a meal ticket to the mother. That action might be described as child abuse on Deborah's "bell curve" too. Yesterday I was speaking at the Libertarianz conference and we had a discussion along similar lines. That fathers should face up to their financial responsibilities. Bear in mind that even when they meet child support requirements most only pay a fraction of the DPB cost to the taxpayer. Mitchell said the traditional political response is to demand fathers face up to their financial responsibilities. "However, the child support problem is only a spin-off from the DPB system. If there was no DPB, which acts as an incentive to single parenthood, there would be nowhere near the current number of liable parents - 130,762. The state has effectively replaced many fathers who are nevertheless expected to pay the bills for children they often have no role in raising. " "As a general rule fathers should take responsibility for their children but the state has to stop skewing the morality of this by putting up cash rewards to prospective single mothers." "Before the DPB it was difficult for mothers to chase maintenance through the court system and fathers ran the risk of conviction and imprisonment for reneging on a court order. But that was forty years ago. Today, avoiding becoming pregnant and giving birth is much simpler. And in respect of relationship breakdowns, women, who now make up half of the workforce, are much better equipped to handle being a breadwinner and men are much better equipped for sharing parenting." "Until the DPB is reformed to suit the times, the taxpayer will continue to foot the lion's share of its cost."